Merlin, Stitched in Time: A Damsel in Distress or a Distressing Damsel? It's clear, the list is off the table. I started with a nice, defined, short list of what I intended to make this year. They're from the 1790s and the pic is from Vintage Textiles. I originally saw them on American Duchess ages ago and saved the pic, then found it when organizing files. 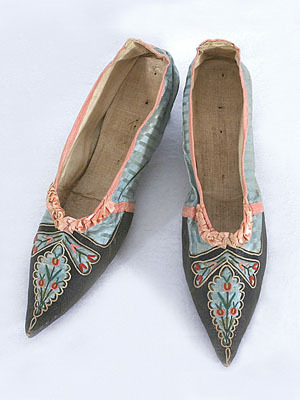 One cannot make shoes and not have a dress to go with them! So despite the 1790s not being my favorite time, that joined the list. Then we decided to have some fun and run around at the NY Renaissance Faire as more than just the secret project. Lover and I like having characters to be. 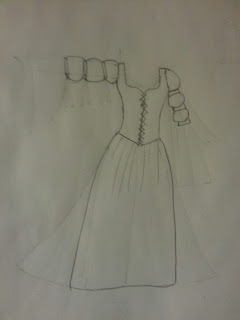 And since part of the Secret project also works as Hero Attire (Clue #3). We decided to also go as the Hero/Damsel. Which was more to design! But really fun to play, I mean who doesn't want to be rescued and swept off her feet every once and a while? Don't get me wrong, I like Belle as a character, sometimes, but I really don't want people to think that's who I'm dressed up as. And Once Upon a Time is a really good show, but I want this to be me, one of my characters. So back to the drawing board. 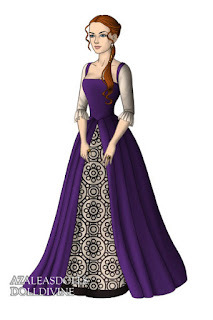 So I thought I need to be in a dress that could be a "working dress" for a noblewoman in the Elizabethan Times, because A) for some reason upper class women are the majority of the ones who run around damselling. and B) I wanted to be even a little historical. 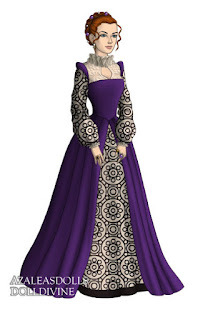 Also because I fell in love with pretty purple linen off Renaissance Fabrics. Linen would be nice and cool for the hot summer. So I got bored and doodled, and since I can't find the sketch, I have a pic of the idea that I did off the Tudors Scene Maker off Doll Divine. It's a really cool way to get ideas and lose track of massive amounts of time. The left image shows my Elizabethan character, Isabel, dressed for court before the Queen, and the right shows her as a damsel in a working dress which is really the same as court dress just with unlaced sleeves, sleeve rolls, no ruffs, partlet or fancy hair. The idea is to be on the summer progress with the Queen, ie like a RenFaire. My plan is to make the purple out of purple linen, the underskirt and sleeves out of damask or flocked fabric, and then have all the pieces. So now there are sixes things on the list instead of four. And I've already made some stuff I didn't even bother to list. Perhaps I need to learn to plan better. Or maybe it's just a costumer thing.